Recently, I discovered just how much fun motorcycle racing games can be. After reviewing Monster Energy Supercross, I checked out some of Milestone’s previous releases I had missed out on. Naturally I was excited at the idea of reviewing MX vs ATV All Out, the newest game in the long-running series. I don’t have much experience with this franchise, but hey it’s got licensed bikes and sponsors, how bad can it be? Unfortunately, the answer to that question is pretty damn bad. 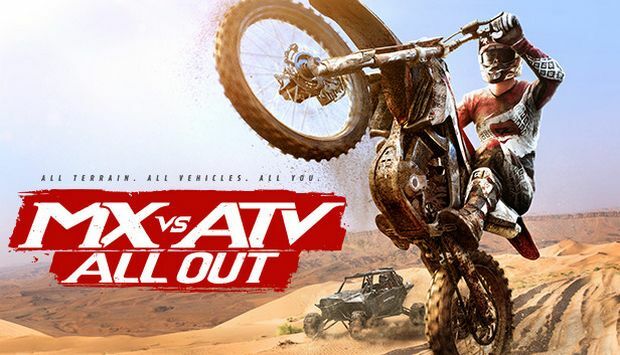 While I like to focus on the positives in every game I review, MX vs ATV All Out is the rare case where I can’t wholeheartedly recommend it as it stands. ALL screenshots are from in-game, compare them to the screenshots in the marketplace for a laugh. 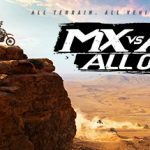 For anyone unfamiliar, MX vs ATV All Out is a driving game where you race motorcycles and/or ATVs against each other. 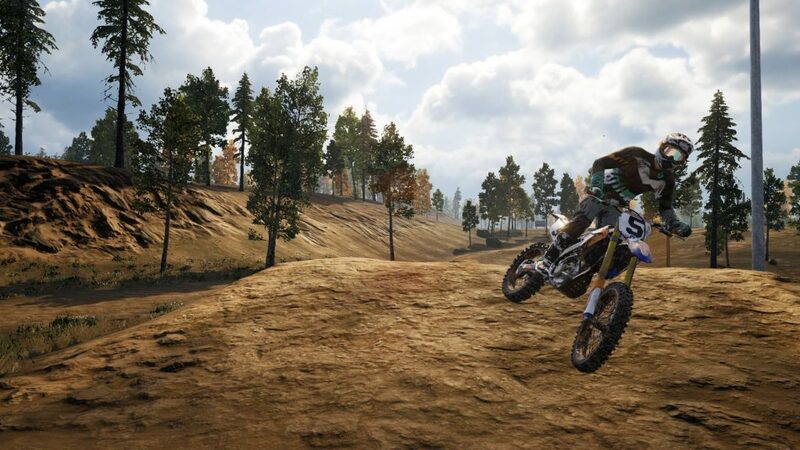 You start out by creating your own rider and racing in standard vehicles, but as you complete events across all modes you earn credits to purchase new vehicles, gear or upgrades. Once you begin playing, you are spawned into an open area where you can practice jumps, gather collectable gears, and test out your rides. A simple press of the menu button brings up your gameplay choices such as: online, time trial, arcade (1-2 player), series and single event. I was happy with the amount of content presented here. Series mode varies from amateur to pro levels in offroad, motocross, arenacross, opencross and freestyle. You will typically find yourself competing up to a dozen races with the goal of being first overall. You can quit a series and try another without fear of losing progress. Red gears are collectables and can be hard to get. Ride around this hub area to practice whatever you’d like. 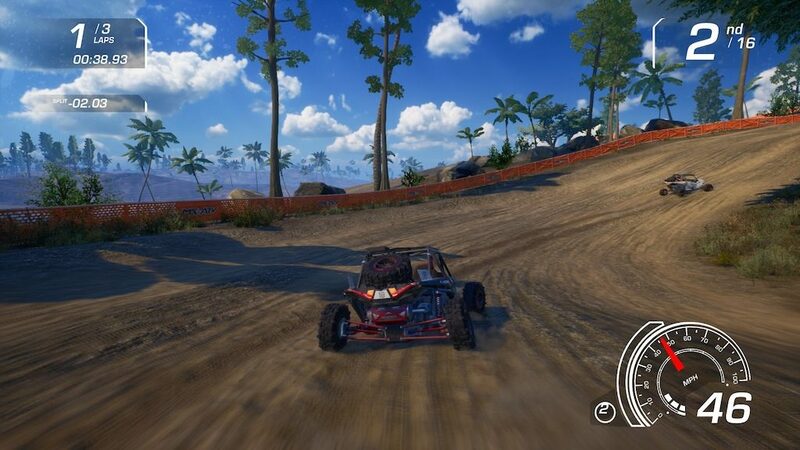 Despite a good amount of content to play, the actual act of racing in MX vs ATV All Out is quite laborious. As soon as any race begins, the shortcomings of the graphics engine are glaringly apparent. The fluidity of movement is incredibly choppy and while I can’t prove it, the frames per second seemingly takes a nosedive. 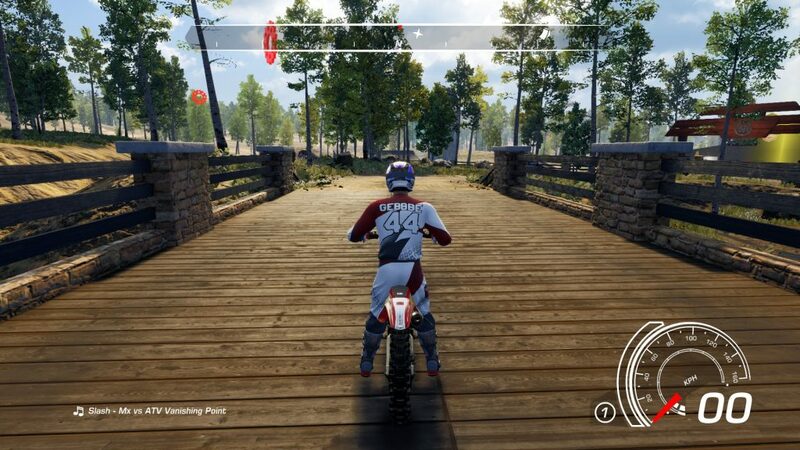 It doesn’t matter if there are other riders on screen or if you are alone, the game does not run smoothly on my original Xbox One. Adding to that is repeated screen tearing and texture pop in that just makes for poor overall graphical presentation. I also found it disappointing that seemingly everything in a level is purely cosmetic. See a puddle of water? It won’t go splashing the screen or causing any sort of traction loss. There are barriers and people standing on the sidelines, but you can drive right through them, often not even being penalized for going off track. This is a shame because the level designs are surprisingly quite enjoyable. Many outdoor areas can even be considered beautiful if I was looking at them in photo mode. There are some nice locations and lighting, especially when the sky reflects off standing water. The fluidity of gameplay is improved in indoor supercross areas, but not by much. The soundtrack suffices but is hardly memorable, why bands from my childhood like Offspring are still being featured in video games is beyond me. Turning corners at fast speeds is a breeze thanks to forgiving arcade-style controls. Controls are another mixed bag in MX vs ATV All Out. They are definitely catered to players who like an arcade experience rather than authentic. I was tearing through races going very fast and making plenty of sharp turns that would have caused me to spin out in other racing games. While nobody likes to crash all the time, I felt the controls took it a little too easy on me. There is no rewind function, so players must drive carefully. Sadly, I was unable to test out the online modes, as nobody was ever playing online when I tried. Customize your bike or attire and pause the action in photo mode. It’s hard to feel any way about MX vs ATV All Out other than disappointed. Developer Rainbow Studios had all the licenses they need and a recognizable brand, but just couldn’t tie it all together. The amount of content in the game would justify the $49.99 cost if the fluidity was not so terrible. I loved some of the level designs but my appreciation when down quickly, much like the framerate, when nothing reacted to me as I drove through. The entire experience is frustrating and frankly, painful on the eyes to endure. I can’t recommend MX vs ATV at any cost, instead put that money towards MXGP 3 or save for the upcoming MXGPro.